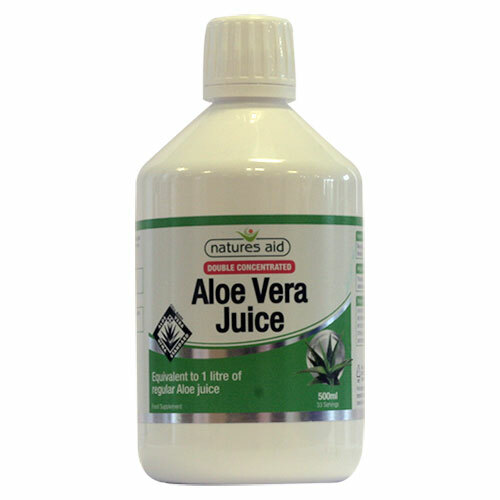 Natures Aid Double Concentrated Aloe Vera juice is made up from the Aloe barbadensis plant. The core of the leaves are carefully filleted and pressed to ensure the juice retains its unique properties and is high in the beneficial enzymes naturally present. All the natural laxative promoting materials have been removed. Suitable for vegetarians and vegans. Natures Aid Double Concentrated Aloe Vera Juice - 500ml. Aloe Vera Juice Concentrate, Citric Acid, Preservatives (Potassium Sorbate, Sodium Benzoate). Take 1 capful (15ml) per day. Below are reviews of Natures Aid Double Concentrated Aloe Vera Juice - 500ml by bodykind customers. If you have tried this product we'd love to hear what you think so please leave a review. Much milder taste than my usual brand so very refreshing. I take it every morning in a large glass of water to help with acid reflux and set me up for the day ahead. Occasionally also taken at night if my acid reflux is bad. Very soothing. Good price as purchased two when on offer. Prompt delivery and good packaging as always from Bodykind. Natures Aid Double Concentrated Aloe Vera juice is made up from the Aloe barbadensis plant. The core of the leaves are filleted and pressed to ensure the juice retains its unique properties and is high in the beneficial enzymes naturally present.